Vintage Solitaire 14k White Gold Engagement Ring | Shane Co.
Give her this delicately engraved vintage inspired bridal ring in 14 karat white gold that will uniquely represent the love you share. 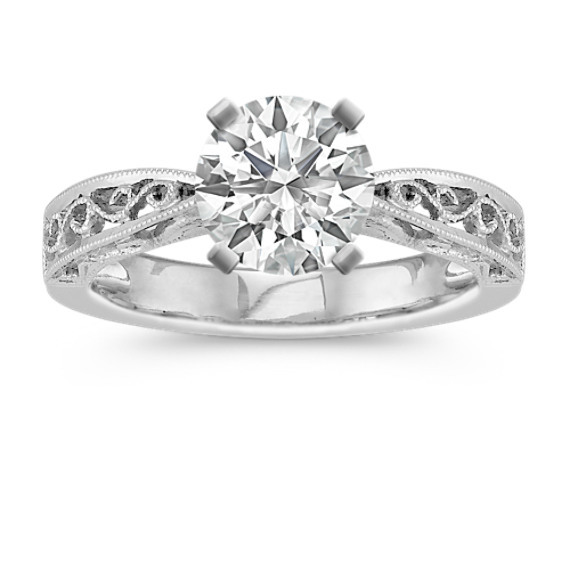 Complete the look by adding the center stone of your choice. My fiancé found this setting online and showed it to me. I really liked it so we took a trip to Shane Co. They did not have this setting in the store for us to look at (which greatly disappointed us because the store isn't close to us and quite a drive to . We looked at different jewelry stores to find something similar and found nothing similar. My fiancé ordered this ring (without a stone) and we figured if we didn't like it he would return it. He ordered it Sat. and, it arrived that coming Monday! We were both delighted and it is prettier than expected! He purchased a .7 carat diamond elsewhere who set it and I received it yesterday, on Christmas Day! It is stunning!!!! My fiancé is the real diamond though as I've told him! This is my engagement ring and it is beautiful! I wanted a ring that didn't have lots of bling but was still interesting and this was perfect. My husband picked a ice blue sapphire to go with it. I love my ring and have the band to match! This is a great ring! !